In early September, Denair Unified School District increased its Internet bandwidth by more than sixteen times. Since the mid-2000’s, DUSD was connected to Stanislaus County Office of Education, their Internet provider, by four T-1 lines through AT&T. The 6 MB connection served the district well for several years, but as additional modern computers and mobile devices gulped down data at increasing rates, as well as increasingly bandwidth intensive kinds of content network users were accessing, the schools saw periods of time when Internet access slowed to a crawl. Often, the 6 MB connection to the Internet was completely saturated. Ranes expects the 100 MB fiber connection to meet the needs of the District for the next couple years, but as Internet technologies change, the capacity will need to be revisited on a regular basis. As Internet video becomes more pervasive, demands on network resources will continue to increase. The good news is that the new fiber connection is 1000 MB-ready and capacity can be increased easily. 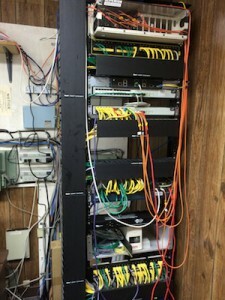 Ranes says he will be monitoring average utilization of the fiber connection to make sure it continues to meet the needs of students and staff. Posted in News and tagged DUSD, fiber, Internet.